So it’s fall! Light coats, boots, pumpkins, coffee, crisp air, beautiful leaves and all the warm and fuzzy feelings too. But there are some essentials when it comes to pulling off that perfect fall look. The main one being… you guessed it, your hair. t You always want to pull off an effortless and chic hairdo to complement your outfit. Here are some of my favorites that are cute, simple and perfect for the season. t Buns are fun! They are great for the day or night. We are going to concentrate on a “not so neat” one in this look. t Part your hair toward the direction you would like. Then tie it all up in one. You don’t necessarily need to use a brush, because the look is more natural and you really want to get the bohemian feel. But if you prefer a smooth finish you can. t Roll your hair up in the shape of the bun. You can use hair clips or a scrunchie to keep it in place. Some gel or a styling product of your choice can be used to smooth everything in place as well. t Add a cute floral band or any hair accessory to give it that extra pop. t Braids are versatile. Whether you’re running errands, meeting up with the girls, or planing a hot date. You could never go wrong with a cute braid. t Take a section of your hair from the top. Tie the rest of the hair in the back with a scrunchie. t Begin braiding the portion that was sectioned off to the side. You can choose the side on which you would prefer the braid to fall. t Tie a rubber band or scrunchie at the end of the braid. Let the back portion of your hair down. t This part is if you want to kick it up a notch! Instead of leaving that back portion of the hair down, you can pin it up with some hairpins to give it a more dressy look. t This look is for the days you really don’t feel like combing your hair. But you can still be cute on those days too! t Swoop up all your hair very high on the top of your head and tie it with a scrunchie, leaving some of your hair tucked in. 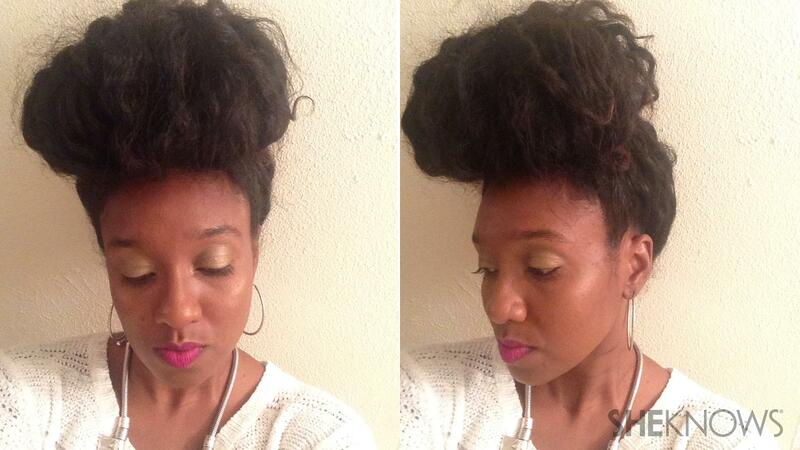 So you’re not pulling all the hair through, but keeping it in the bun formation. t Add some gel or a styling product of your choice to smooth out the sides and the back. t Begin pinning everything in place with bobby pins. t You can leave it messy, or neaten as much as you can too. It’s more of a personal preference. t And there you have it! These hairstyles are truly suitable for every hair type. So be cute, be confident and always remember to add your little touch, too. Happy fall!